Of all the recipes on my blog, I think Un-Deepfried Zucchini is the one I make the most. I’m not nearly tired of it, but I thought I should try something new with it. So I just added a little parmesan to the breadcrumb mixture. I still like it with a little yogurt, to which I add some fresh/frozen dill and a little salt and pepper. 1. Mix the breadcrumbs, salt and pepper, and the parmesan together in a bowl. Crack the egg into another bowl and mix it up with a fork. 3. 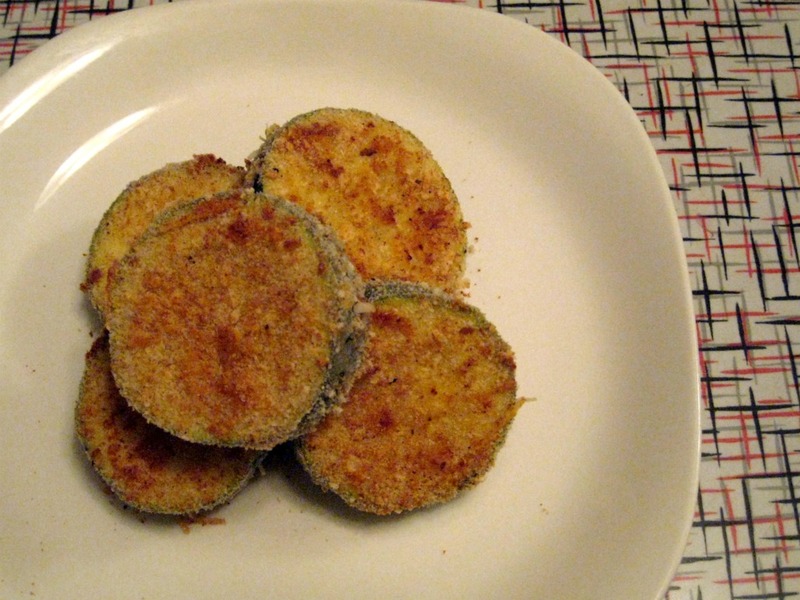 Dip the zucchini pieces in the egg, then press them into the breadcrumbs so they are coated. Place on a baking sheet – I don’t grease mine and they don’t seem to stick. 4. Pop them in the oven – I usually put them in before it’s finished preheating, and it’s not a problem. Bake for 10 minutes, then flip them over and bake for another 10. They should be very soft when you’re done, so check them and maybe throw them back in for a few minutes. Serve hot on their own, of with a dipping sauce of your choice. Stay tuned for #3!